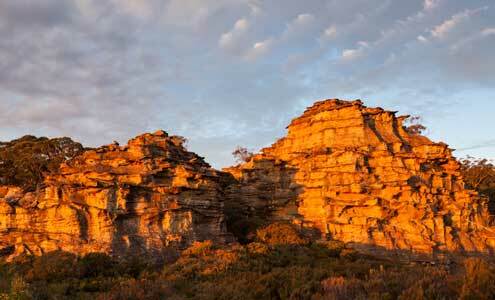 The Gardens of Stone area was named for its spectacular rocky terrain and wildflower heathlands. 'Platy' pagodas like these are internationally rare, and considered to be of global significance…but the Greater Blue Mountains World Heritage Area is currently not listed for its geodiversity values. Gardens of Stone is a marketing name that stuck. 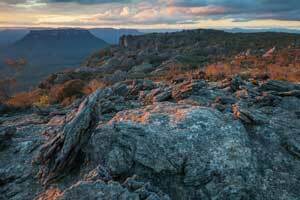 After Wollemi National Park was secured in 1979, conservation groups such as the Colo Committee turned their attention to the spectacular unprotected escarpments edging the Wolgan and Capertee Valleys north of Lithgow. They needed a name for the area which would highlight its very special qualities to the public. Anyone who explores the escarpments in springtime will agree that Gardens of Stone is an entirely apt description. They will see waves of flowering heathland punctuated with many weird and wonderful shapes of sandstone that cascade down to the edge of ochre-coloured clifflines. These outcrops display intricate fretwork and natural sculptures of ironstone that are endlessly fascinating, and can be compared to beehives, towers, turrets, domes, pyramids and even oriental temples – which is why they have come to be known as 'pagodas'. 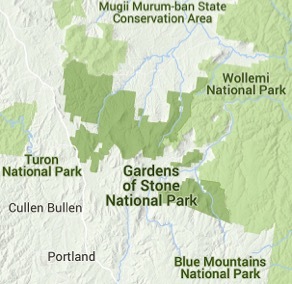 A Gardens of Stone National Park was finally created in 1994. 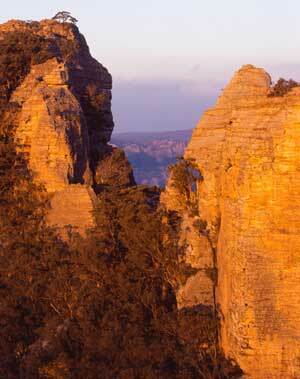 It covers 15,000 hectares and joins Wollemi National Park on the northern part of Newnes Plateau. 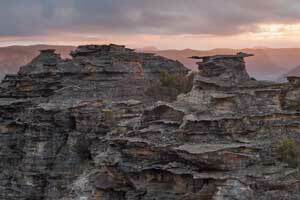 Other large landscape features include the outstanding mesas of Donkey Mountain in the Wolgan Valley and Pantoneys Crown in the Capertee Valley. 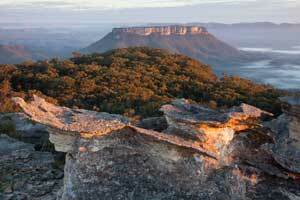 Pantoneys Crown was previously protected in a much smaller nature reserve, and is the centrepiece of the commanding view of the valley from Pearsons Lookout on the Castlereagh Highway. But Gardens of Stone is an unfinished park. These unprotected areas are just as valuable as the existing park, and are rich in special environments such as pagodas and canyons, nationally endangered high altitude shrub swamps and an unusual heathland on Genowlan Mountain. Rare and threatened species include the beautiful yellow Pagoda Daisy, Deane's Boronia, Blue Mountains Water Skink, Wolgan Snow Gum, Giant Dragonfly, Regent Honeyeater, Genowlan Pea and Beautiful Firetail. In the western parts of the area the moist mountain vegetation begins to give way to drier inland communities, including grassy box woodlands, one of the most diminished and threatened environments in Australia. The Gardens of Stone Stage 2 is more accessible than the existing park, and offers plenty of easily reached bushwalking, cycling, four-wheel-drive touring, camping and scenic viewing. But despite a wealth of aesthetic, conservation and recreational values, the greater Gardens of Stone continue to be damaged by activities such as illegal trail bike riding and poorly managed mining activities. Pantoneys Crown dominates the south-western head of the Capertee Valley and is a classic example of a butte: a small, cliff-topped peak isolated by erosion from the surrounding plateau. It was the centrepiece of the 1977 Pantoneys Crown Nature Reserve until the reserve was absorbed into the new Gardens of Stone National Park. Erosion of the plateau-capping Triassic sandstone has created many other dramatic features, like this pagoda gap on Donkey Mountain. Donkey Mountain stands isolated in the upper Wolgan Valley, separated from Newnes Plateau to the east and the unnamed range dividing the Capertee and Wolgan valleys to the west. The origin of the convoluted ironstone layers within the sandstone remains mysterious, but the weathering processes that create the pagoda shapes are better understood. As the softer sandstone is removed by water leaching through the rock, the hard ironstone resists and stands out to create remarkable and delicate sculptures. Eventually, as the level of the rock erodes downwards, resistant ironstone shards collect on the surface like bits of car engine in a junkyard.